Yeager and Etkind will assist clients in applying for U.S. citizenship and will address issues of physical presence, good moral character, age, knowledge of U.S. history and English, and disability waivers. Permanent Residence as evidenced by the green card entitles an alien to many benefits, including the right to live and work in the United States, and the right to travel to and from the United States indefinitely. 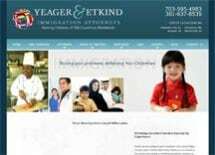 Yeager and Etkind Attorneys can assist families in bringing relatives and friends from abroad to the United States for temporary stays. Abogados, Yeager and Etkind have been assisting the public with matters regarding immigration and transportation law since 1990. As a young, small firm with multiple offices, we bring our enthusiasm and energy to helping resolve legal concerns that affect your daily life.